National Apprentice Week (NAW) 2019 takes place from 4th-8th March and is coordinated by the National Apprenticeship Service. It is designed to celebrate apprenticeships and the positive impact they have on individuals, businesses and the wider economy. Apprenticeships provide key training while allowing students to earn money as they learn. In addition to the hands-on skills developed, apprentices quickly learn the importance of regulations and procedures, process safety and interpreting documentation. 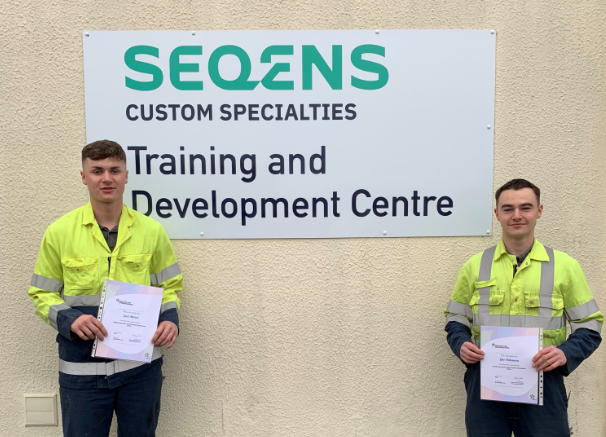 Instrument Technician Luke Williamson and Electrical Technician Lewis Mitchell from Seqens Middlesbrough, successfully finished their apprenticeships earlier this year. Luke and Lewis started in 2015 and spent their first nine months at TTE Technical Training Group, where they completed trade specific training. Having also completed CompEx Training, aimed to assess and validate technical operatives working in potentially hazardous or explosive atmospheres, the young men are in the process of completing their HNC qualifications in Chemical Engineering. Luke is currently working on an exciting new project of redesigning a mobile mass flow meter, whilst Lewis is getting involved in an equally stimulating project, installing new pump guards onsite. Whilst Seqens currently has eight apprentices across the Billingham and Middlesbrough sites, the company appointed its first apprentice in 1990: Electrical Technician Paul Harrison. Paul attended evening classes, achieving various qualifications and strongly supports the need for apprenticeships. Seqens prides itself on its steady intake of apprentices and recently appointed five Process Operator positions, ahead of the new plant investment at Billingham.